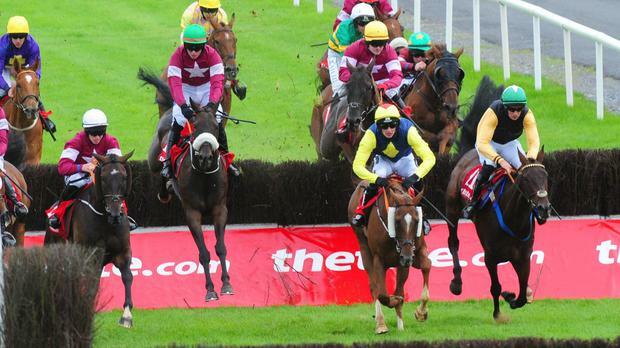 Lord Scoundrel and conditional jockey Donagh Meyler claimed a thrilling victory in TheTote.com Galway Plate. Part of a formidable team of eight runners in the 22-strong field for leading owners Gigginstown House Stud, Gordon Elliott's seven-year-old was sent off at 10-1 for the prestigious handicap and began to make significant inroads on the leaders rounding the turn for home. Willie Mullins' Ballycasey and Ruby Walsh led the field into the straight, with stable companion Alelchi Inois and an Elliott-trained wave of Devils Bride, Clarcam, Shadow Catcher and Lord Scoundrel all on his tail to set up a grandstand finish. Lord Scoundrel came home best to prevail by a length and a quarter from Alelchi Inois, with Ballycasey and Devils Bride third and fourth respectively, as Elliott bagged a first win in the race. Elliott, who ended a drought at the meeting with a winner in the last race on Tuesday, said: "Thankfully we had plenty to fire at it and it worked out great. "This has been the plan for this horse since we let him off last year, to get him back and train him for this. He had some good novice form and thankfully it's worked out. "He was one of the three we fancied and it worked out great. It's Donagh's first ride for me and he gave him a good ride. He works for Tony Martin, so he's obviously a good rider. "I said to him if he was within a couple of lengths of them two out he'd stay better than any of mine. "We've had placed horses before in the Galway Hurdle, but to win this is nice. Winning races like this keeps us up there in the trainers' championship. Unfortunately I'm up against Willie Mullins, but we might keep tabs on him for a little longer now. "I didn't have a winner at Galway for five years until last night. We had lots of placed horses." Meyler, who rides Quick Jack in the Galway Hurdle on Thursday, said: "Gordon had Lord Scoundrel spot-on for today and he was brilliant the whole way. I got a nice start but I missed the second so it took a little time to get him back into his rhythm, but I left him alone. "He was always travelling down the back and he was jumping great. I got a lovely run down the inner the whole way around and he was giving me a lovely feel. He winged the second-last, ran off the bend a bit before getting a bit closer to the last but he popped it and once he met the rising ground, he flew home up the hill. "He didn't half stay, he was very good. My agent Ciaran O'Toole did a great job as he got me on Lord Scoundrel so I have him to thank." Hot favourite and 2014 winner Road To Riches was sketchy in his jumping and eventually pulled up by Bryan Cooper. He was examined and found to have been struck into on his left hind leg, that he had lost a shoe and was slightly lame. Elliott and Mullins dominated the finish, training the first six home.